These satin adjustable bow tie & suspender set combo are made of a deluxe poly satin and are very durable and can be hand washed or machine washed on a gentle cycle and lay flat to dry. They are pre-tied bow tie with a wraparound neck strap that is fully adjustable and hooks underneath the bow knot. The kids bow tie size fits ages 2 to 12 measuring about 1 3/4" high and 3 1/2" wide with wrap around adjustable neck strap fitting 10.5" to a 14.5 ". The men's bow tie size fits size 14 and up measuring about 2 1/4" high and 4 1/2" wide with wrap around adjustable neck strap fitting 13.5" to a 22.5 ". The suspenders are a 1inch adjustable stretch elastic suspender with X-Back design. They are crafted with an easy to open metal clip-on closure with Mylar inserts for easy comfort. 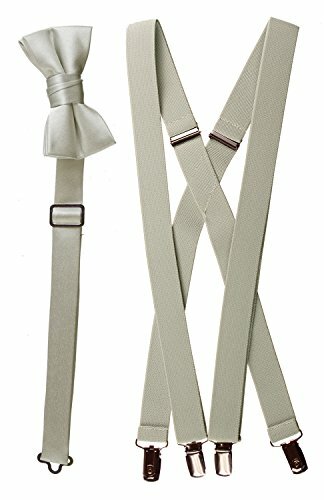 Suspenders are available in 4 sizes including Toddlers 25", Boys 30", Young Men's 40" and Men's 48". This beautiful bow tie and suspender set combo is available in 43 striking colors to choose from: Antique Gold, Apple Green, Apple Red, Berry, Black, Burgundy, Caribbean Blue, Champagne, Charcoal Grey, Chocolate Brown, Coral Reef, Emerald Green, Forest, Hot Pink, Glacier Blue, Gold, Ivory, Jade, Lapis, Baby Blue, Light Silver Grey, Light Pink, Light Yellow, Lime Green, Mandarin, Mint, Navy Blue, Plum Purple, Purple, Porto Lavender, Scarlet, Red, Royal Blue, Salmon, Silver, Light Blue, Sunrise Yellow, Tan, Tangerine, Teal, Tiffany Blue, Turquoise,Sage, Celery, Meadow Green and White. Our beautiful bow tie and suspender set combo will add the finishing touches to your formal wear! These beautiful bow ties and suspender sets are perfect for weddings, parties, birthdays, dance groups, work attire, school functions like band, choir, orchestra. And so many more special occasions and events! Satin Adjustable Bow Tie & Suspender Set Combo in 43 Solid Colors for Toddlers, Boys, Young Men and Men. Kid's Bow Tie Size Fits Ages 2 to 12 Measuring about 1 3/4" high and 3 1/2" wide with wrap around adjustable neck strap fitting 10.5" to a 14.5 ". Men's Bow Tie Size Fits 14 and up Measuring about 2 1/4" high and 4 1/2" wide with wrap around adjustable neck strap fitting 13.5" to a 22.5 ". Satin Bow Ties are a pre-tied bow tie with a wraparound neck strap that is fully adjustable and hooks underneath the bow knot. Suspenders are a 1 Inch Adjustable Stretch Elastic Suspender with X-Back Design. They are crafted with an easy to open metal clip-on closure with Mylar inserts for easy comfort. Suspenders are available in four sizes including Toddlers 25", Boys 30", Young Men's 40" and Men's 48".